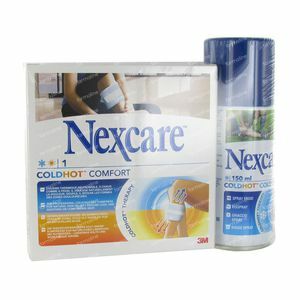 Nexcare 3M Coldhot Comfort 26.5cm x 10cm + Free Coldhot Spray 1 item order online. Reusable cold and heat pack, relieves both cold and hot pain in a natural way. Heat therapy is used for the treatment of chronic muscle / skeletal pain (without acute inflammation). The heat help relieve pain and muscle spasms. Coldtherapy is used forthe treatment ofacute injuries(eg,sprains,hematoma)andfor relievingcertainkinds of paindue totraumas in themusculo-skeletairsystem.